This week's episode of Star Wars Rebels saw Jedi fighting alongside Clones again. Just like on The Clone Wars - "just like the old days" as Rex would say. 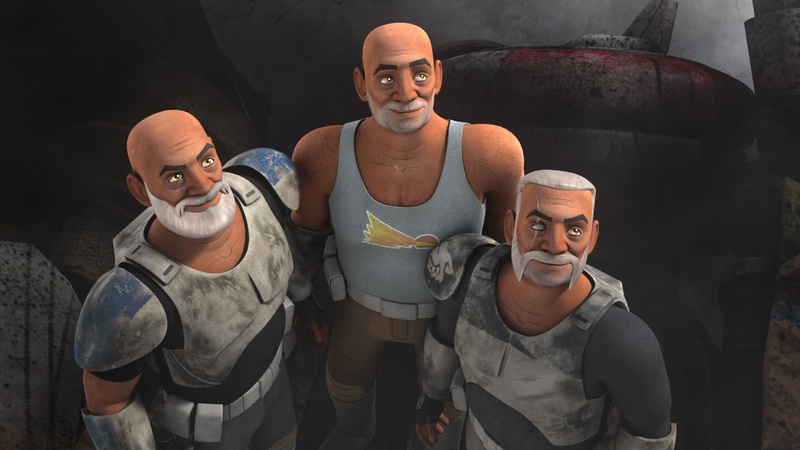 'Relics of the Old Republic' was--in many ways--a tribute to the gone but not forgotten animated series Star Wars: The Clone Wars, which ran from 2008-2014 and introduced us to the clones Rex, Wolffe, and Gregor who all appeared in this episode. Not that I'm complaining. The episode was filled with little Easter eggs for fans of The Clone Wars, from Rex talking about his Jedi general, to comparing clone troopers to stormtroopers (which, granted, wasn't something explored on the show but was discussed at length by many fans), to nods to 79 - the Clone bar on Coruscant. It was a nice tip of the cap from the crew (many of whom worked on The Clone Wars) to the fans. “Relics of the Old Republic” has some fantastic visuals--the sequence in the dust storm stood out in particular. It was very striking to see only the silhouettes of the AT-ATs, the AT-TE, and Ezra and Sabine as they manned the gun. My one complaint about this sequence was that the music undercut the tension in the scene. It's rare that the music in Star Wars would seem unnecessary, but in this scene it seemed to me that the tension would have been heightened with just the sound of the wind, the dust, and the vehicles. The episode also did an excellent job of showing the beginnings of a growing trust between Kanan and Rex. It looks like the series is playing the long game here, which I think is the right way to go. It wouldn't make sense for Kanan, who experienced betrayal at the hands of the Clone troopers during Order 66, to immediately trust them again. The trailers for the rest of Season two show that Kanan still maintains a level of mistrust towards Rex, and that this will be revisited at least once more. Rex, on the other hand, seems very eager to work with Kanan and to have the Jedi trust him. From the way Rex tells Ezra about his time serving with Anakin during the Clone Wars, we can tell that he misses those days and wishes he could recapture the spirit of that time. It's clear that he sees serving with Kanan and Ezra as a second chance - a way back to his glory days, serving alongside the Jedi. There were some equally interesting developments on the Imperial side this episode. Poor Agent Kallus--this guy just can't get a win! Kallus has been ineffective when going up against the Lothal Rebels since the Grand Inquisitor's arrival last season. His only victories have come when his superiors, specifically Darth Vader and Grand Moff Tarkin, are around. This week was a new low for Kallus, as Admiral Constantine abandoned him on the planet (though whether or not there was any malice intended towards Kallus on Constantine's part is debatable -- after all he'd just gotten a call from Darth freakin' Vader!) Hopefully this embarrassment will help light a fire in Kallus, so that next time we see him, he's out for blood. I do hope the show is able to turn Kallus' character around, because right now he seems to be running on borrowed time. In some ways it feels like he is only still around to have a rematch with Zeb (their first encounter in "Droids in Distress" was a standout moment from Season One). But surely no one in their right mind would want to kill off a character voiced by David Oyelowo unless they really had to! And finally, how can we not talk about the final scene? The reunion of Ahsoka and Rex -- two characters who defined The Clone Wars era of Star Wars -- back together on screen, they did exactly what we wanted them to: share a laugh and a hug. In this moment, these two characters, who have been through so much since we last saw them, reverted to their old selves. Even the animation of Ahsoka evoked her younger self in a way it hadn't during her previous appearances on Rebels. And the dialogue was perfect. Overall, this was a stellar episode of Star Wars Rebels. Seeing the Clones back in action was moving, especially when it seemed as if they were going to make their final stand so that our new heroes could get away. The character motivation and development in this episode was spot on and set up some interesting scenarios for later in the season. And the final scene, which could easily have come across as cheesy fan service, was executed to perfection. egads - whatsa meesa sayin?!! I'm, frankly, underwhelmed by these two episodes...they feel like a forced way to placate all the die-hard Clone Wars fans who keep badgering anyone who will listen (and, really, anyone in general) to bring the show back, and a heavy-handed way for Filoni to relive his own "glory days," so to speak. That's not to say that I didn't enjoy them, but they're probably my two least favorite episodes so far. I'm definitely curious to see how the clones factor into things going forward, and what becomes of them (because, like the majority of the Rebels crew and Ahsoka, I can't see them living past the events of Rogue One). I'm glad we were introduced to the fifth brother at the end, and that the preview for next week showed the seventh sister, because the inquisitors, and lack of information about them, are what's piqued my interest the most about this season.